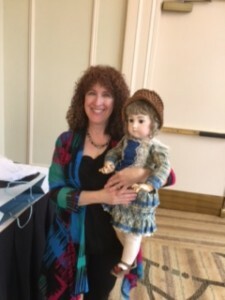 Of course, this holds true for any live doll event, be it a doll doll convention, a doll class or seminar, a doll club meeting, a doll show or doll sale. And do we want live doll events to disappear for lack of attendance? We definitely do not. So I hope to see you out and about in the doll world next time! I will talk more about the events from this doll weekend on this blog…I have included one photo of me with a doll new to my collection to whet your appetite. 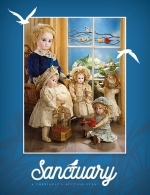 This entry was posted in Antique Dolls, Buying Dolls, Doll Events, Uncategorized and tagged antique dolls, doll auctions, doll events, theriaults. Bookmark the permalink.